吴晓芬, 周慧, 曹敏杰, 刘增宏, 孙朝辉, 卢少磊. 2019. WU Xiao-Fen, ZHOU Hui, CAO Min-Jie, LIU Zeng-Hong, SUN Chao-Hui, LU Shao-Lei. 2019. Oceanologia et Limnologia Sinica, 50(2): 278-290. WU Xiao-Fen, ZHOU Hui, CAO Min-Jie, LIU Zeng-Hong, SUN Chao-Hui, LU Shao-Lei. 2019. PRELIMINARY QUALITY DISCUSSION BETWEEN SHIP-BASED CTD AND PROFILING FLOATS OBSERVATIONAL DATA[J]. Oceanologia et Limnologia Sinica, 50(2): 278-290. Abstract: It is well known that the development of marine science depends on accurate data, however, a variety of marine observation instrument that work in complicated ocean environments may unavoidably produce measurement error, lead to the need for real-time (or delayed mode) data quality control. 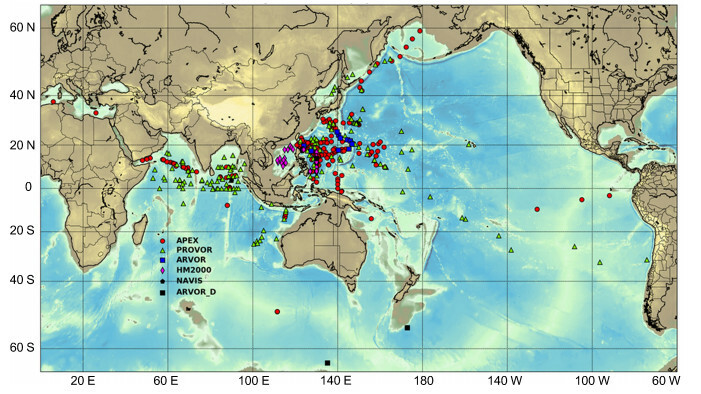 This article mainly gives a real-time contrast among the data collected by ship-based CTD instruments, Argo profiling floats and high-precision laboratory salinometer after two voyages carried by China Argo program. Analysis results show that the data inspection through laboratory salinometer is very important for in-situ observational data, especially for the ship-based CTD observations, and is thus vital for the calibration of temperature or salinity data, especially for deep ocean. Just like the comparison gave, the salinity near 1000 dbar acquired by a ship-based CTD which was not calibrated before the voyage, has a differential of nearly ±0.1 compared with laboratory salinometer observation. Such lags are far behind the accuracy of ±0.02 salinity measurement requirement in the domestic ocean survey specification. Based on these tests, we suggest that researchers who are engaged in the open ocean survey should give a focus on the data quality control with different instruments, for example, the ship-based CTD should be sent to authoritative department for calibration before and after a cruise, in order to promote and improve the quality of the national marine observational dataset.